Submersible pumps are found in many applications including drainage, sewage pumping, general industrial pumping and slurry pumping. The pump can either be connected to a pipe, flexible hose, or lowered down guide rails or wires. Since the development of that first pump, the industrial and commercial markets have relied heavily on the unique benefits that these pumps offer. Converting dry pits (aka “dry wells”) to use submersible pumps rather than non-submersible pumps has many advantages. Most importantly, dry pit submersibles eliminate the need for flexible drive shafts and help protect against station flooding — which we all know can be quite the head throbber. Converting existing dry pit pumps to submersible pumps requires no piping, foundation or structural changes. In fact, it’s as simple as removing your existing pump and replacing it one of our “ready-to-install, drop-in replacement pumps” that use a closed-loop cooled motor rather than a sewage cooled. We can replace Fairbanks Morse, Aurora, Chicago, Clow, Crane Deming, Morris, Smith & Loveless, Worthington and Yeomans. 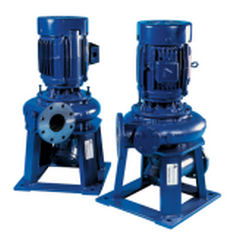 Contact C&B Equipment to convert your dry pit pumps today!